The City of Martnsburg, as well as Berkeley County could become a worldwide tourist destination by focusing on installing public art in all of its forms. 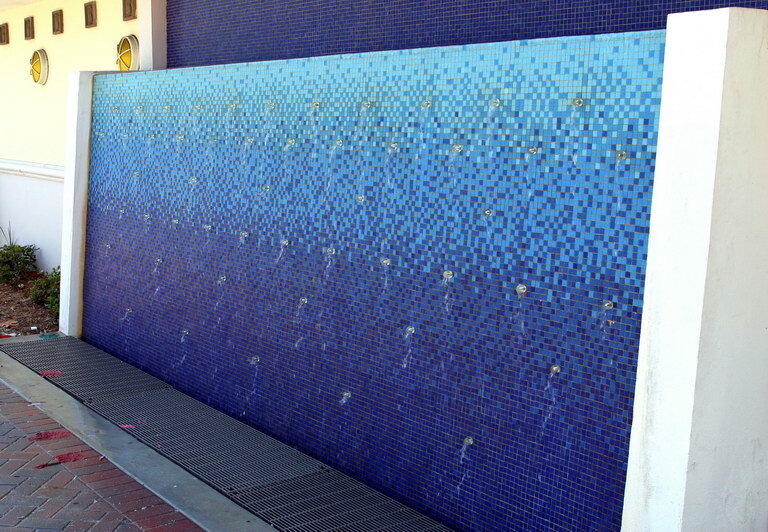 There are so many forms of public art that could engage and inspire visitors as well as be a call to future visitors. 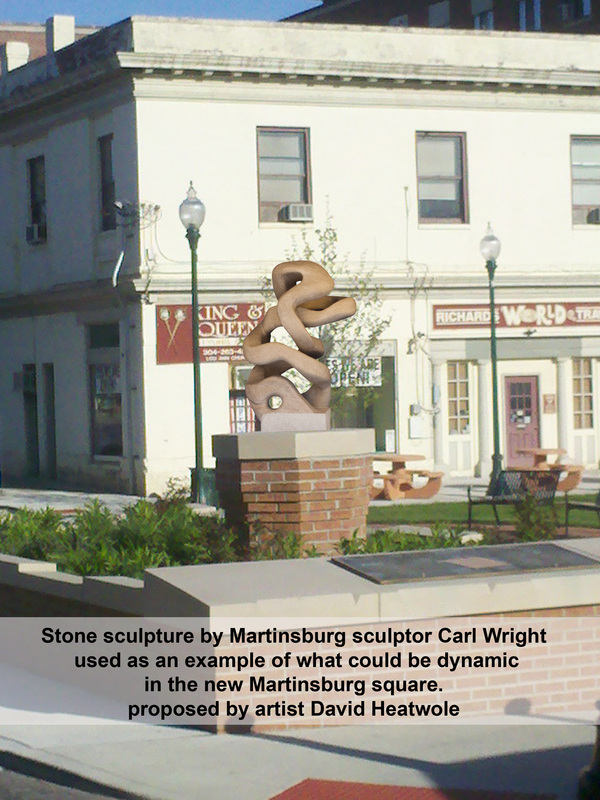 Mission: With strategic focus on bringing public art into the city much can be accomplished, to not only preserve what Martinsburg has, but also to enhance the experience for both visitors and residents. We can accomplish the above mission through the use of creativity and the energy of like minded people that want to see Martinsburg come to life in a positive way. 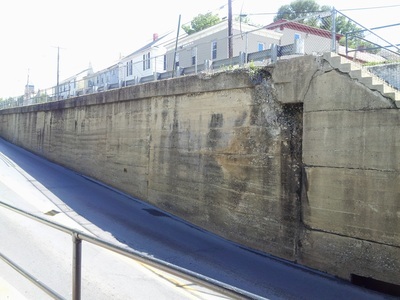 The following are just a handful of locations within the historic district of Martinsburg, WV that need some attention for one reason or another. Also, shown herein are just a few ideas that could be implemented but in our own unique ways that could accomplish this goal. 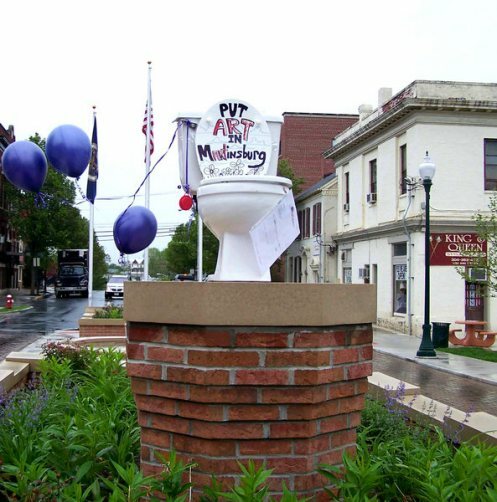 ABOVE: The decorated toilet was placed on the empty plinth in the center of Martinsburg. Heatwole was given a ticket for the public art statement. 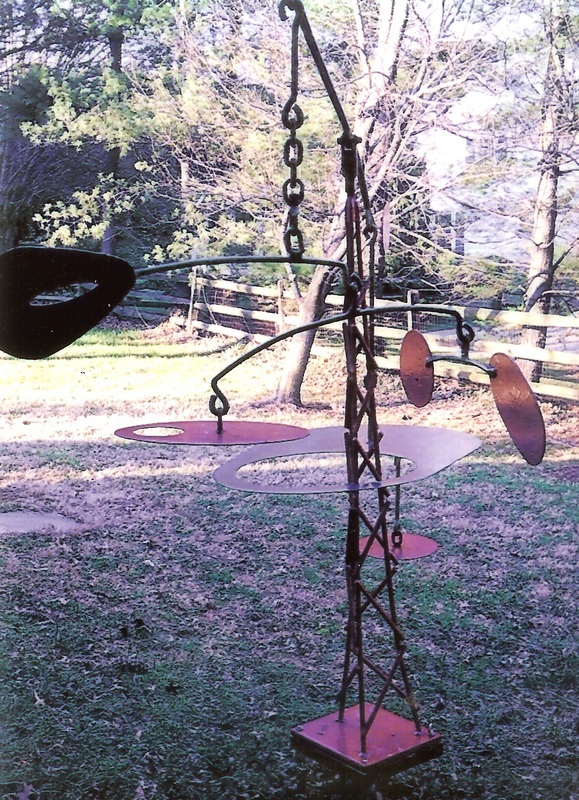 BELOW: This kinetic sculpture was offered to the city as a place holder until Heatwole's plan could be executed by the well known art collectors Steve and Linda Krensky of Maryland. Create walking paths in cooperation with such organizations as the Berkeley County Parks and Rec. with sculpture of all styles and mediums being showcased. The sculpture collection could be built upon year by year as the city has contests for new site specific work created for the center piece in the heart of the historic district. As a new work is installed on the stand the old pieces will be relocated to new sites around the area. David Heatwole has proposed to manage a biennial sculpture competition with the grand prize winning piece being featured on an empty plinth located in the green space in the center of town. He has not be successful getting permission to do this yet from the City Council. In the process Heatwole made international news. 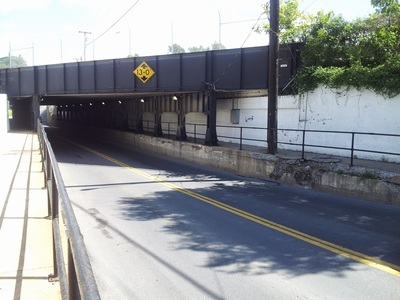 One might consider the train overpass tunnel traveling south bound on Edwin Miller Blvd as being the gateway into the historic downtown of Martinsburg, WV. 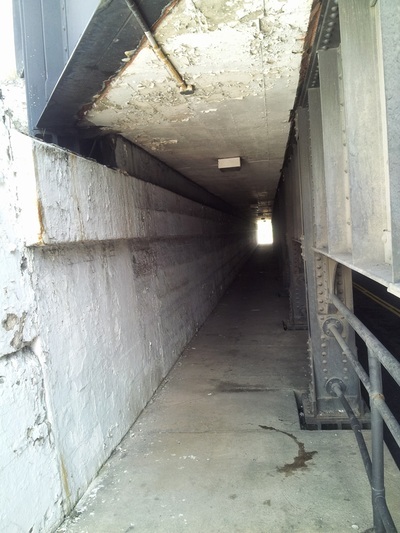 Heatwole is proposing to transform this tunnel area on Queen Street into works of art using artificial flowers and chicken wire to transform the space. Another tunnel/train overpass the artist would like to see transformed is located on Burke street traveling east away from the historic district but on this particular tunnel the artist would like to see mosiac tiles used. 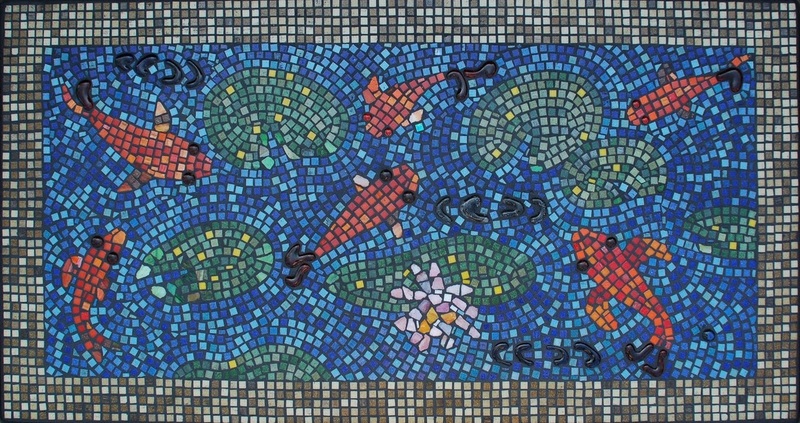 These do not have to be representational just graphic in nature and nice to look at. Great ways to welcome people into the historic district. 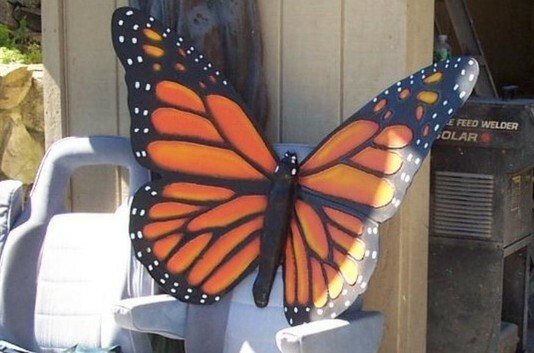 On the sides of selected buildings Heatwole is proposing the placement of mechanical oversized butterflies that will capture the imaginations of all. The artist would like to start the process by placing one near or on his landscape mural located at the entry way into the historic district. 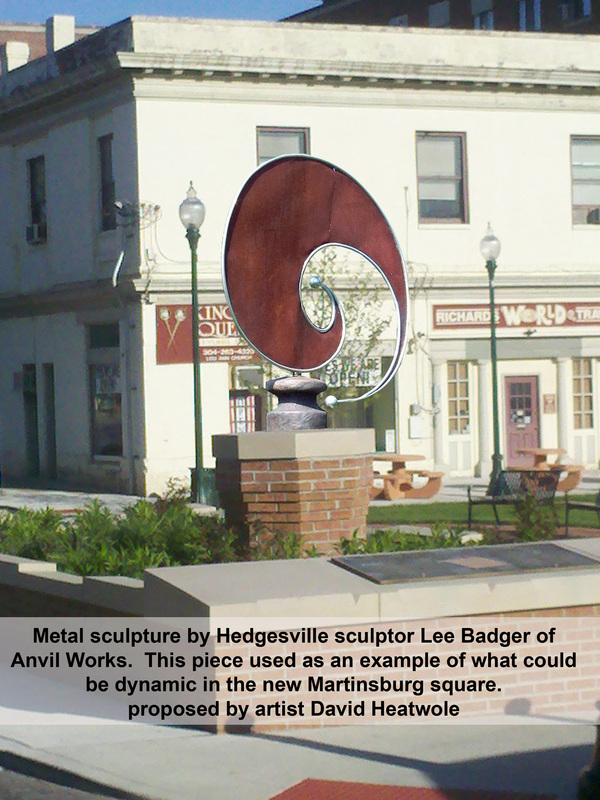 As read above Heatwole has proposed a vital plan to keeping attention focused on Martinsburg through the use of a biennial sculpture competition that will be promoted widely. 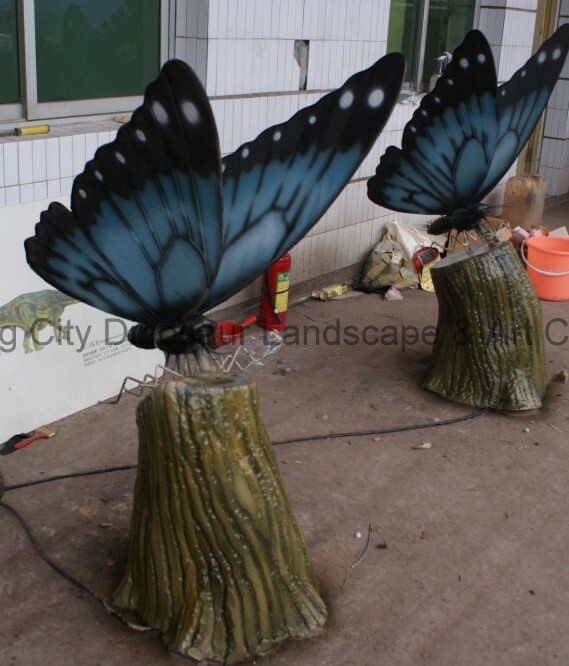 While the artist was very interested in pursing this project he believes that focusing on the other projects mentioned above first will help bring the people necessary to help manage the sculpture project. The alley between 213 N Queen Street (Morgan Awards) and the building immediately to the left of it (Lewis Hardware) has has it's own bit of history. It was recognized by the city as a historical alley that people used to use to get from the train up into town. Because of this recognition of historical impact the alley way must be protected. The problem though is that the only ones that give it any mind are those that like to use it as a bathroom. 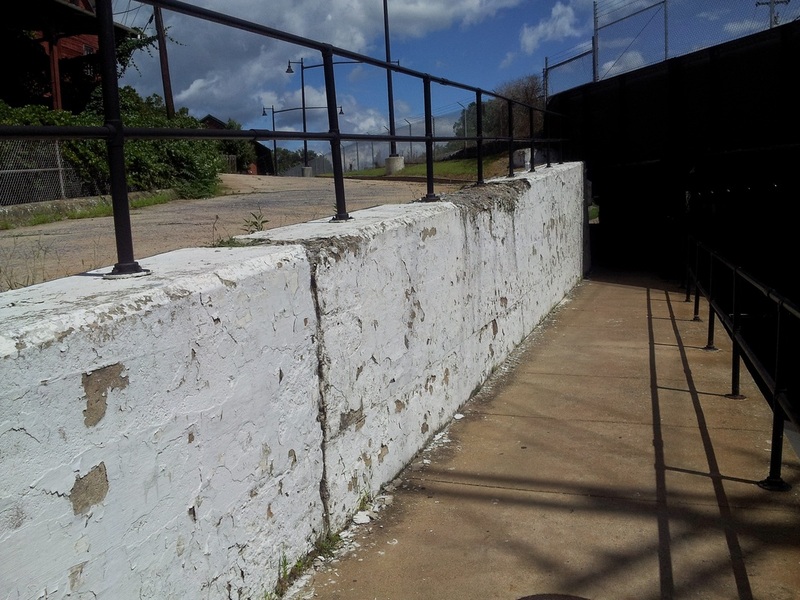 The owners of the two building next to it each own half of the passageway and they both were in the process of deeding it to the city when the attorney who was working on the case passed away some years back. 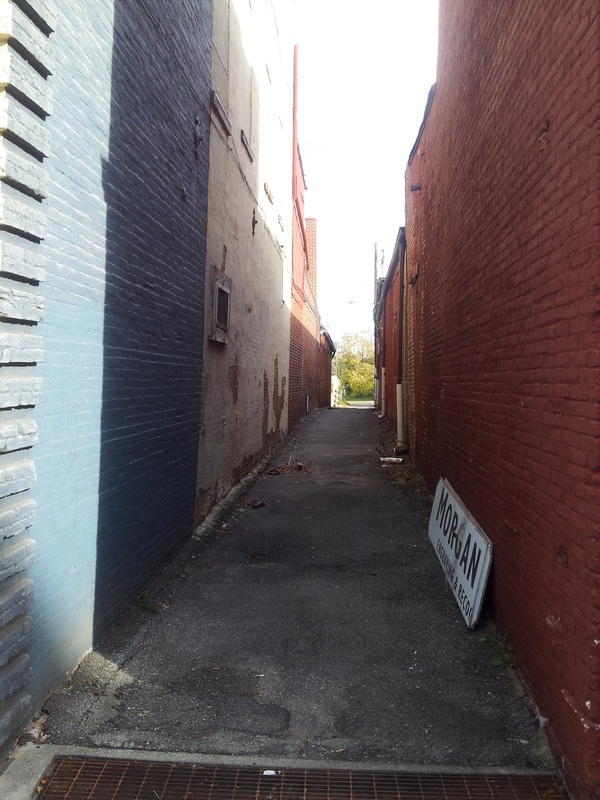 The alley is back in limbo with no one wanting to do anything about it. Except, artist David Heatwole who would like to turn it into a work of art that would shed light on those that want to urinate in it. His idea is to create a light installation and do some other work to make it a work of art that people will want to use it as a safe walkway. His proposal will also make it easier to manage in winter with a slanted roof that will stop snow and traffic the flow of water to a drainage system. 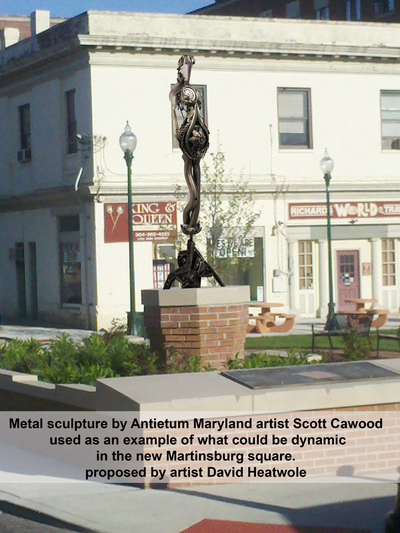 Besides placing sculpture and murals throughout the city of Martinsburg there would be one street in town that would be named Mural Row (or Mural Lane or some such name) for the amount of murals on one street. This could be a real tourist destination if done correctly. In cooperation with Berkeley County Parks and Recreation build an art park that would be a place where the public would want to visit regularly. The visitors would feel the urge to photograph themselves with the permanent works of art to send to their friends via texting and internet social media. 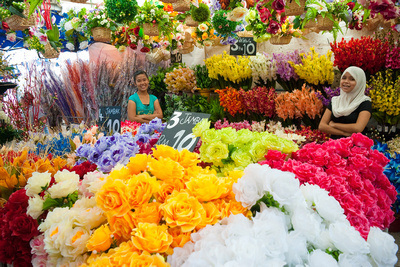 With help from local master gardeners create flower gardens that will accentuate public sculpture and possibly even decorate building walls. See some amazing samples below from other communities around America. People love water. We are naturally drawn to it. Create a rain wall that kids can put their hands in and that will create a sense of wonder for downtown Martinsburg. This could be a free standing work of art using thick glass and a water piping system that would allow water to rain down the glass walls.